It's easy to measure your horse's girth (also called the "heart girth"). A horse's heart girth measurement can be helpful for several things including getting an estimate on the size of the cinch your horse will need, and for calculating an estimate of a horse's weight. To measure a horse's heart girth, measure from the base of the withers down to a couple of inches behind the horse's front legs, under the belly, then up the opposite side to where you started. Notice this will cause your tape measure to run at an angle as shown by the blue line in the photograph below. The measurement you arrive at is your horse's heart girth. 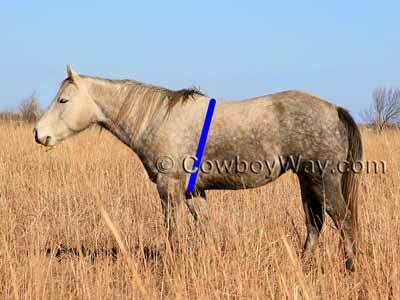 Why Measure Your Horse's Girth?